A Japanese friend once explained to me nattō plays the equivalent divisive role in her country that Marmite does here in mine; you either love it or you hate it (although more Japanese seem to consume it despite any dislike, apparently because it is so nutritious). 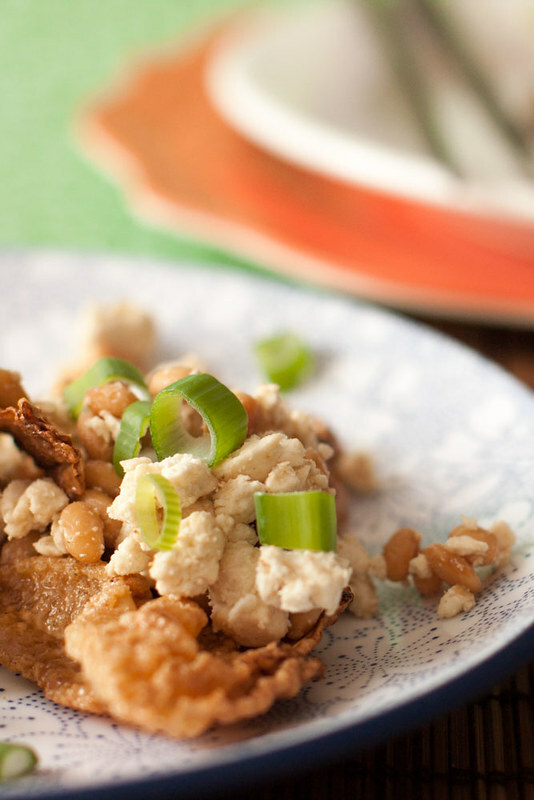 This fermented soy product lays the smackdown on your senses. Really. I know precisely three people who not only eat nattō, but don’t wretch when I mention it by name. To say the smell is potent is an understatement if there ever was one (weeks old dirty gym socks come to mind), and I can’t explain the taste in a much more savoury tone either (when heavily fermented it carries a slight ammonia aftertaste). The texture of nattō is comparable to snot and it looks equally unappetizing. I love it. I mean crave it beyond all reason kind of love it. Nattō sushi is one of life’s greatest pleasures so far as I’m concerned, and I promise if you know me I have already tricked you into eating it at least once (sorry, friends, but it’s true). I have one friend who shares my enjoyment in the odd hostile affront on the taste and olfactory senses, and he is who suggested what is the greatest breakfast of all time: pan fried yuba with nattō and vegan blue cheese. I added a few extras, but the combination of just those three ingredients in beyond anything my mind can process. 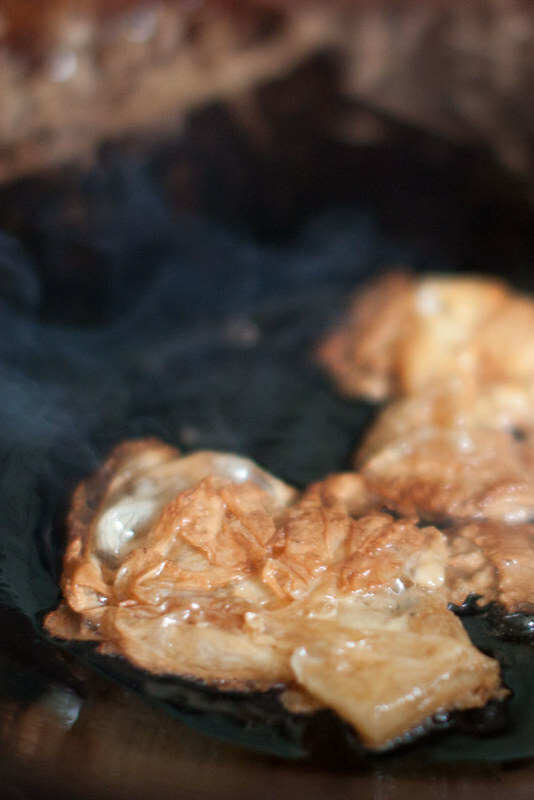 Yuba (soy milk skin), frying. The first time I had a bash at the awesomeness, I mixed approximately equal measures of crumbled blue Sheese and nattō (totaling perhaps 1/4 cup), plus half a cube of fermented white bean curd. I rehydrated some yuba in a mixture of soy sauce and hot water, wrung it out, and fried it in homemade garlic oil. I served the dish with a few strips of toasted nori and a sprinkling of chopped spring onion. On day two I simplified the process marginally by omitting both the soy sauce and garlic oil components. First of all this dish already packs a salty punch, so the soy sauce took it marginally over the top for me. And speaking of punch, the flavours are so strong they cancel out the garlic in the oil. Yeah. Looks good, yes? It is. Do it.